Mahesh Dattani has appeared quite frequently on this blog. It’s no more than a coincidence. Mahesh was a guest at the Toronto Festival of Literature and the Arts in 2011, where he first narrated the genesis of his interest in theatre. Girish Karnad was the other eminent playwright at the festival, and along with University of Toronto’s Dalbir Singh, they had a scintillating exchange of ideas of contemporary theatre in India. Then, last year, he was in Toronto for a series of speaking engagements, and during that visit, the SawitriTheatre Group staged Seven Steps around the Fire, and the University of Toronto’s the Centre for Drama, Theatre, and Performance Studies, in collaboration with the Centre for South Asian Studies and the Centre for Comparative Literature organized a staged reading of Mahesh’s The Big Fat City. On a recent visit to Bombay, I visited the highly-recommended Kitab khana, the bookshop in the heart of Bombay (Flora Fountain), and among the books that I picked up was Mahesh’s Me and My Plays (Penguin, 2013). The book comprises an essay – Me and My Plays, and two of his latest plays – Where Did I Leave My Purdah? and The Big Fat City. Actor, director, and Mahesh’s collaborator in transforming Dance Like a Man into a phenomenon that it has become, Lillete Dubey has written a foreword to Purdah. Actor Achint Kaur has written the foreword to Big Fat City. 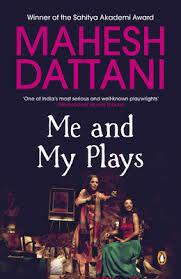 I’ve written about Me and My Plays based on Mahesh’s talk in Toronto last year (see here: Mahesh Dattani Festival in Toronto), so I don’t want to repeat it. But I must emphasize that it's a crisp and lucid narration of the last 25 years of his journey as a playwright. After reading the essay, it does strike me as plausible that Mahesh may have thought of penning his memoirs after his narration in Toronto during our 2011 festival. By the time the 1990s rolled in, my theatre group, Playpen, was established and recognized in Bangalore. It was possible for me to move from one production to the next, confident that I would somehow manage to get a sponsor. I had begun to work on my new play Bravely Fought the Queen and was putting the finishing touches to it when I got a call from Alyque (Padamsee). He asked me if I was aware of the motion in Parliament by the VHP (Vishwa Hindu Parishad) about building a temple in Ayodhya in place of the existing mosque. I was in my early thirties then, but as naïve about politics as today’s seventeen-year-old. This wasn’t even headline news at that time and so had slipped my attention. Alyque was most concerned with the rise of religious fundamentalism and was certain of a program brewing that would destroy the cultural harmony of the country yet again. I wasn’t too sure of doing a play on the Hindu-Muslim divide. Sensing my hesitation he invited me to Mumbai and arranged an improvisation with Pearl Padamsee’s students at the JB Petit school. The improvisation had two Muslim boys who, running away from a mob that is out to kill them, seek shelter in a Hindu household. The improvisation was riveting and I could see the dramatic possibilities. It took me almost two years to write it (Final Solutions). Again I was keen to do my own production in Bangalore first. But a week before the scheduled performance at the theatre festival, the Babri Masjid was destroyed. Although I had based my play on the Tazia riots in Ahmedabad in the 1980s, the play now took on a different shade. The festival organizers pulled the play out of the festival at the last minute. It took another two years before it could be staged. An NGO in Bangalore offered to stage it. The tag line read ‘A plea for tolerance’. But due to its initial ban, word had gotten around that the play was controversial. I was advised by friends not to do it, especially in the light of the Bombay riots. I remember, a whole section of the auditorium was filled with practising Muslims who were keen to see the play, and later I came to know that most of them had never been to a play before. The performance was met with silence. But the actors found themselves surrounded by new fans after the performance. Many of the Muslim members in the audience came backstage and congratulated the actors. They could not believe that the actor who had played Javed was not, in fact, a Muslim. Clearly, the actor was the hero. And I vicariously reveled in that heroism. When the actor politely introduced me to them, they showered me with gratitude for putting up the play. I even made a new friend, who, till this day, continues to call me on and off just to inquire after my health and well-being. I was deeply moved by the heartfelt response to my play. Perhaps it was this kind of unconditional acceptance that I carved for as a human being. Now I was ready to take on the world.